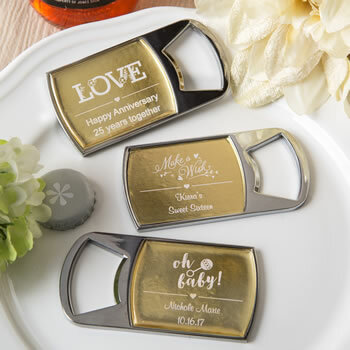 Bottle openers make great favors for any type of occasion. These quality openers can be personalized with a label of your choice that is protected with an epoxy dome, for an ultra high-class look. Our quality openers are made from solid caste metal with a shiny chrome finish. The rugged design features a solid hand hold and an opening on the end for easy opening of beverages. A molded metal plaque on the top features an inset for placing your customized label that is designed to fit perfectly. The plaque is then covered with an epoxy dome to protect and preserve the label and add a professional finish. Be creative and use our exclusive online tool to design and preview your own labels before ordering. Choose a stunning metallic gold or metallic silver label with white print and select a design from our huge range that will match the theme of your event. Size is 3 1/4" x 1 5/8"
They are mostly nice except you have to put them together yourself and there are many air bubbles, fog or residue left beneath the epoxy dome. Absolutely loved this product! There is assembly required but it's super easy! Would recommend for a party favor! !